Some of the nation’s best chefs are headed to La Jolla May 29th – 31st for a one-of-a-kind culinary event. 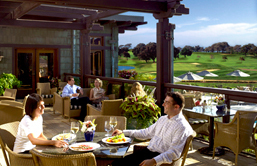 The James Beard Foundation’s Celebrity Chef Tour will showcase San Diego’s best produce and California wines, against the beautiful backdrop of The Lodge at Torrey Pines. Food Network star Beau MacMillan and James Beard Foundation Award-winner Carrie Nahabedian will join The Lodge’s Executive Chef Jeff Jackson for this exclusive, 3-day, farm-to-table event. It kicks off Friday, May 29th with a cocktail reception and dinner at The Lodge’s signature restaurant, A.R. Valentien. The next morning, Saturday, May 30th, begins with breakfast at The Grill, followed by an interactive farm tour and lunch at USDA Certified Organic Point Loma Farms. Saturday evening is the Celebrity Chef Tour Dinner. The five-course, farm-to-table menu will be prepared under the stars and paired with wines from Nickel & Nickel, Far Niente and En Route. Then Sunday, May 31st, the event wraps up with brunch on the Arroyo Terrace. To make your reservation for the James Beard Foundation’s Celebrity Chef Tour, call 858-453-4420 or click here. And be sure to click on our story below for more on The Lodge and our interview with Executive Chef Jeff Jackson.